Girl Scout cookies aren’t the healthiest cookie out there. They are highly processed and full of nasties like trans-fats, GMOs, and artificial flavors. Basically all kinds of man made stuff that doesn’t belong to a healthy diet. But, luckily, with the help of three beautiful ladies from Natural Sweet Recipes you can easily make even more delicious and healthy versions at home! 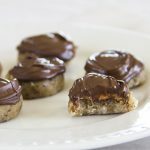 This no bake vesion beat the original boxed version FOR SURE and have a delicious, vegan ingredient list. Plus, they can be eaten almost instantly. Win! 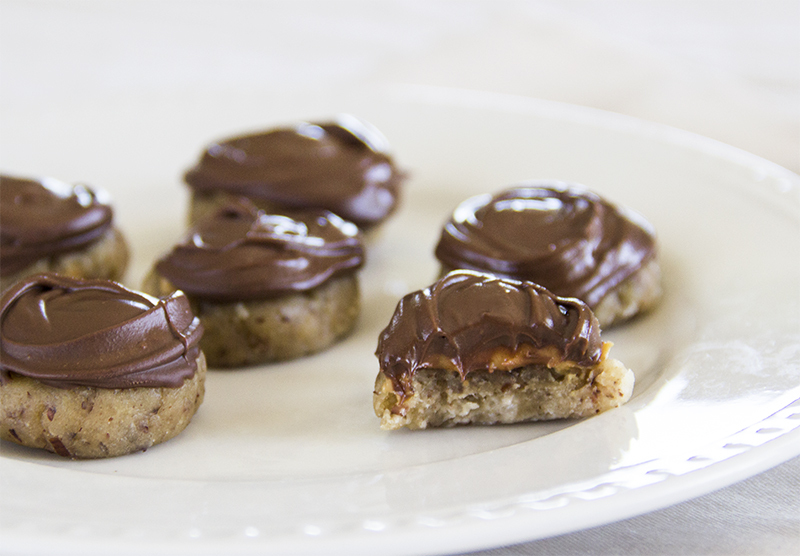 You’re going to love the flavor of these bites just overflowing with peanut butter and chocolate! 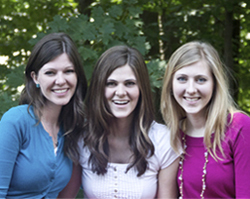 Annie, Holly and Chelsea Forsyth are three sisters who began blogging in late 2011. Their love of sweets and passion for healthy eating inspires them to create nutritious desserts on their blog, www.naturalsweetrecipes.com. They love traveling, photography, spending time with family and creating delicious baked treats together. Find them on social media to follow along with their healthy baking adventures! Their cookbook, The Everything Naturally Sugar-Free Cookbook came out in Fall 2014 and can be found through Amazon. Find them on social media to follow along with their healthy baking adventures! In a mixing bowl, combine the dry ingredients and whisk well. Add the wet ingredients to the bowl at the same time and carefully mix to incorporate. The dough should be a soft play-dough consistency. If it’s too dry, add a few drops of milk until it comes together, but be careful to not add to much liquid! Scoop out about 2 teaspoons amount of dough for each cookie, roll into a ball, press flat, creating a slight indent in the middle. This indent will help keep the peanut butter in place when pouring the warm chocolate over the cookies. Next, mix the peanut butter and stevia in a small bowl. Place about a teaspoon of peanut butter onto each cookie. Once done, place in the freezer for 15 minutes. Meanwhile, melt the chocolate chips slowly until they are just melted (warm and soft but not super hot). Remove the cookies from the freezer and dip the cookies in the chocolate or carefully coat with a spoon to cover the cookies. You will want at least a teaspoon for each cookie. Return the cookies to the freezer to firm for about 2 minutes. These cookies are delicious when frozen or when just firm and the chocolate is nice and silky soft! Store any leftovers in an airtight container in the refrigerator. I made these the other day and they were so good! I did have to make a few substitutions because I lacked certain ingredients such as stevia and almond and spelt flour. I used agave and unbleached all purpose flour instead. Not as healthy I know. My daughter and her friend liked them too, but thought the only thing I thought could be better was that the “cookie” part tasted a bit too floury. Is this because of the type of flour it is? Do almond and spelt flour make a big difference? Thanks, I am looking forward to making these again soon!!! Jenny thanks for the comment. In no bake recipes the flour makes a big difference. If you don’t have almond flour on hand try food-processing some raw almonds- simply just process them into a flour or similarly you can make flour out of oats.